The hydraulic system, consisting of the master cylinder, calipers, wheel cylinders, pads, shoes and associated connecting valves, lines and hoses, as in a conventional brake system. The ABS controller (computer), its associated sensors (INPUTS), actuators (OUTPUTS), required wiring and connectors. 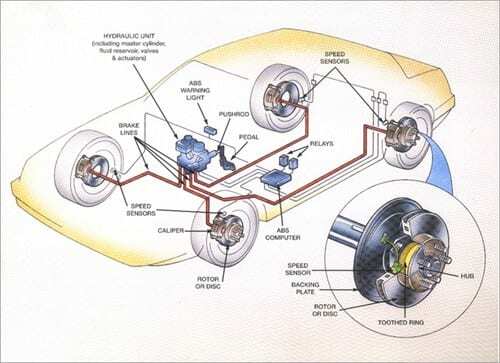 The computer receives signals from the individual wheel sensors regarding the speed of each wheel. It then compares the speed of each wheel with that of the others. If that comparison indicates wheel lockup is present, appropriate signals are sent to the various valves and actuators to raise or lower hydraulic pressure to the individual wheels to correct the skid. This action is repeated thousands of times per second, producing maximum stopping ability under all conditions. All of this activity goes unnoticed by the driver unless a component fault is detected by the computer and the “BRAKE” or “ABS” warning lights are illuminated on the dashboard.